Academic offerings include 5 main schools, 8 Academic programmes in both Degrees and Diplomas, and certificate courses in different fields of specialization. Welcome to LivingStone International University’s School of Ministry. LIU exists to promote excellence in African and Global Christianity by training Christ-centred leaders who will transform the Church and society. LIU seeks to achieve this through its innovative and relevant programs that are based on solid evangelical, biblical, and theological foundations. Our academic programs offer students relevant skills, develop their abilities to think critically, encourage them to be innovative, build character and integrity and help students to deepen their understanding of the Christian faith. All of these enable LIU graduates to become effective ministers and transformational leaders for the Church and society. LIU offers a Bachelor of Arts degree in Christian Ministry (BCM) and a Diploma in the same discipline. The programs are offered at our main campus in Mbale City at the slopes of beautiful Mount Elgon in eastern Uganda. Both the Diploma and Bachelor programs have their emphasis in Biblical Studies, Ministry, and Theological Studies with concentrations in New Testament, Old Testament, Missions, Ethics, Systematic Theology, Communication, Culture and Pastoral Ministry Studies. The School of Ministry is at the heart of LIU, which is a ministry-oriented school par excellence with an excellent national and international faculty and student body. Make LIU your first choice for theological/ministry education and be a part of transforming God’s people and the world. The challenges facing the church in Africa today are theological in nature and, therefore, theological reflection cannot be ignored but must be given special and critical attention. The African Church needs deeper theological reflection on critical religious, social, political, governance and economic issues facing African societies. 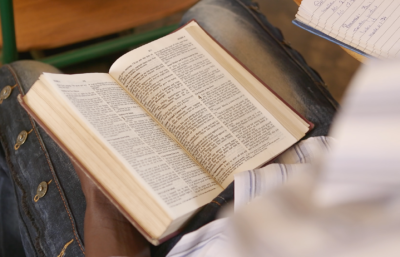 African Christians must give sound biblical answers based on deep theological reflection on these issues in our institutions of higher learning to adequately equip students and leaders to deal with the issues facing the African Church and society. Mr. James Morill, Dean School of Christian Ministry. The program is well modeled and provides students with broad-based training. It is designed to provide both academic and professional training for those called to pastor urban churches, teach in Africa’s theological institutions, or serve in a variety of church or parachurch ministries. Because ministers of the Gospel are to devote themselves to the Word and to prayer (Acts 6:4), the BCM provides excellent preparation for a lifetime of preaching and teaching. The University urges those hoping eventually to pursue a M.Div. in Biblical/Ministry Studies to enroll in BCM, a three-year degree, and concentrate on Church ministry or related disciplines. as well as an interdisciplinary set of courses integrating the social sciences and humanities with Christian ethics, related issues in politics, law, history, society, and economics in various environments. We believe that as scholars in these areas reflects our work professional and scholarly characters while also providing valuable insights into students’ personal and public lives in our highly mediated contemporary context. Theology/Bible ministry training is a significant tool in all sectors of the holistic development process. The primary goal of this program is to lead Christians and particularly the Christian community to glorify and worship the triune God, the Creator and Sustainer of all things but also to glorify God in the way we live and conduct ourselves as God’s covenant community in God’s world. To train and develop Christian men and women who will be led to glory and worship through their understanding of the triune God, who He is, and what He has done, His saving acts for humanity which He has accomplished through Jesus Christ our Lord and through the power of the Holy Spirit. To ensure deeper understanding of theological and doctrinal issues related to the Christian faith in light of scriptures. It is hoped that through these courses students will develop a godly character and grow deeper in their personal relationships with the triune God and with the community of God’s people. To critically and contextually engage the modern world in order to enter into God’s mission to evaluate their relevance for the life and practices of the Church in Africa. To develop Christian thinkers who will research and write while critically engaging the religious, cultural, political, economic, moral and social contexts of African and other societies by applying the truth of God’s word to the diverse cultures and societies in which Christians live, work and serve. Christian Ministry is multidimensional, providing career opportunities in various spheres of ministry, education and service. This degree opens opportunities in such areas as the church, non-governmental organizations, humanitarian organizations and non-profits. LIU strives to develop a student’s knowledge, ministry skills, and leadership potential by providing graduates with exceptional qualification in the diverse areas of Christian ministry. Among these are serving through pastoring, preaching, public speaking, chaplaincyprofessions, human rights advocacy, education teaching professions at all levels, community and public leadership and administration, among others.